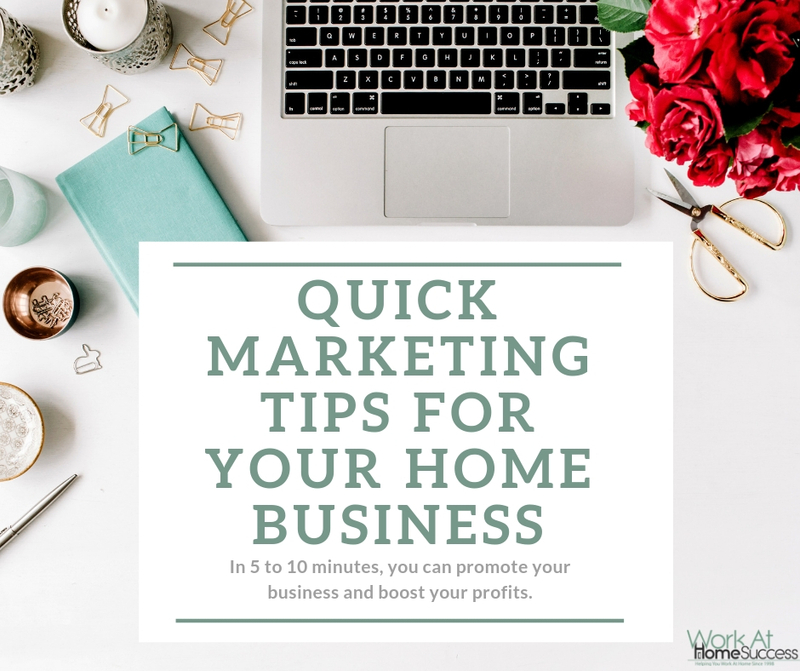 Here are 9 marketing tips to promote your business in only a few minutes! The biggest mistake I made when I first started my home business journey was inconsistent and ineffective marketing. I knew I had to market, but I didn’t understand the psychology of writing enticing content and didn’t have a plan for steady action to get the word out. Today, I view marketing as my main job. Yes I need to provide a great product or service, but no one will buy it if I don’t reach out and find people who need it. It’s easy to get bogged down and even lost in marketing. But it doesn’t have to be overwhelming or time consuming to market your business. Here are some quick tasks you can do on a regular basis to get your marketing message out to your buyers. 1) Read a current marketing article once a day. Marketing, particularly online marketing changes frequently. Find a marketing resource you like, add it to your feedreader, create a “read later” Pinterest board, or bookmark it and check it every day. It takes less than 5 minutes to read an article, and if it offer some new nugget of information you can use, the value is priceless. Some good online marketing resources I like include Duct Tape Marketing, Neil Patel, and Social Media Examiner. Another option is to watch marketing YouTube videos. Neil Patel has many that are short and give you tangible ideas to improve your marketing results quickly. Special Note: I have a notebook I use solely for notes I take when reading blog posts, books, or taking online courses. That way I can always find the information from one source. 2) Check your website stats weekly. If you don’t use Google Analytics, consider signing up because it’s free and you can get a ton of information that will help you save time and money in your marketing. If not, check your web host’s stat information it provides for you. When looking at your stats, pay close attention to your demographics (gender, age, location) and the most popular content on your site. These are clues to who your target market is (or should be) and what they want from you. Also, study your most popular pages, what keywords they’re using to find you, and your biggest traffic sources (where people are learning about you). Recently, I started using the SEO Prospecter from Zag.ai, which pulls from Google Analytics and then provides information on your content and tips for boosting traffic. My favorite feature is the Low Hanging Fruit, which lists the pages on your site that are listed on page 2 of Google and gives you tips on getting them to page 1. With this information, you can better target your content, update and improve old content, and discover what marketing is working (and what isn’t). 3) Take good care of your current clients and customers. I believe customer service is a part of marketing. Recently, HP responded to my Tweet, emailed and called me (yes…called me!!) in an attempt to help me fix a printer issue. Its response led me to buy a new HP printer when the one I had couldn’t be fixed. Clients and customers want to be treated right. They spent money with you and deserve to have their questions answered and problems solved. Not only will this help keep them as a loyal customer or client, but they’ll say nice things about you to others (as I just did about HP). Often it only takes a few minutes to follow up with a client or customer, or respond to them on social media. They’ll appreciate the personal attention! 4) Reach out to current, clients and followers. People who have bought from you, signed up for your email list or follow you on social media are showing an interest in what you have to offer. Return the sentiment by reaching out to them as well. Send them specials, tips or other exclusives that only they get because they’ve signed up to hear from you. 5) Reach out to potential clients and customers. Visit other websites, forums and online groups to answer questions. Don’t simply tell people to visit your site or buy your stuff. Instead, show them you care and have the expertise to help them solve their problems. Potential clients and customers are more likely to buy from you when they trust and have a rapport with you. 6) Connect with influencers and offer to write a guest post or be on their podcast. It takes a few minutes to email or message someone and 30 minutes or less to write a guest post or appear on a show. But that few minutes can get you in front of people who might not otherwise find you. NOTE: It pays to build a relationship with an influencer before asking for something from them. You can build that relationship by sharing their content, responding to their posts and content, and offering to help them. 7) Schedule old posts on social media. I’ve been blogging for years. The old content is still good, but often not seen. Currently, I use Hootsuite to schedule older, good quality, evergreen posts to my social media profiles. However, I’m making the move to Smarter Queue which has a feature that will automatically repost old content so you don’t have to reschedule it. Writing a blog post or doing a video can take time, but it doesn’t have to. For one, you can simply go in and update old content, making it more relevant, improving SEO, and re-scheduling on social media. Another quick way to add new content is through a round up post, where you curate content from your site and other sites around helpful tips or information. I love this resource for finding media outlets (i.e. magazines, radio shows etc), blogs, podcasts and other media sources that need experts. While you can send a press release, with the HARO report you have the opportunity to respond to media that is actively looking for help. Through the HARO report I’ve been featured in Redbook, Womans World and more. And it’s free! If you’re feeling stuck on what to do to market your business, choose one of the options above and do it! Do you have other quick marketing ideas you use? Let us know in the comments below.